Matt has been gone on his Boston trip now since early Sunday morning, and I am surprised to say that the week has gone by so fast. Every other time he has gone on a business trip without us (not a common occurence, but it has happened a few times)I have completely dreaded it. The kids would cry when he left, and there would always be an outburst or two every day when one of them missed him too much. I would dread the horror of trying to care for an infant, a toddler, a preschooler and a grade schooler alone--bedtime alone was enough to make me cringe. We have had fun outings, dinner with friends, reading and games, movies and tea parties. The time has flown by. Today we're off to the aquarium. But I have a feeling that tomorrow at 5 pm, we're going to be even happier! We are in the middle of our second week of vacation from school, and I am coming to grips with the fact that I have a lot of lessons to plan! Matt is away in Boston for the week, so the kids and I have been relaxing, enjoying ourselves and not doing much of everything. Our first week of vacation was Thanksgiving, so there was a lot of running around. This week has been full of fun activities, but quieter and with a lot less driving! I am enjoying it thoroughly. This morning I finally picked up a book I got at the lecture I attended November 4 with some homeschooling friends. The lecture was by David Albert, who is a homeschooling dad, writer, musician, and all around very cool guy. We had a wonderful afternoon and evening of talking, laughing and eating with him, hearing all sorts of stories, and learning new things. I bought several of his books to help me along in our homeschooling journey. The distant huntsman winds his horn. Worn thro' with a dreary shower. When blasts of winter appear? Pretty prophetic stuff, back in a time when most people were being homeschooled! One out of four people in this country is mentally unbalanced. Think of your three closest friends; if they seem OK, then you're the one. Matt is away this week on business, so here I am all alone with my 4 kids. When this happens, I am sort of a fish out of water, because although I am alone with them all day while he's at work, I am spoiled by the fact that he is a very hands-on dad. I am pretty much free after he comes home and dinner's ready--he and the kids clear the table and do the dishes, he does all bath routines, and he gets them all ready for bed (pjs, stories, teeth brushed, etc.) and gets Julia and Ben to bed while I take care of Emma. Plus my early risers (Julia and Ben) get up early with him in the morning and have breakfast, allowing me to sleep in a bit. Also, he only takes 2 business trips a year--and we usually go with him on this trip to Boston! WELL. He left at 8 am yesterday, and the day went very well. We did some chores--laundry, filling bird feeders, straightening up. We played a massive game of Monopoly, watched a movie, we went to Target, where as I promised them a few weeks ago they could each get a small toy to make up for not keeping to our yearly tradition. Had an early dinner, and the three little ones took a really long bath together, playing in the bubbles. I decided to vacuum while they were in it. When Emma got out of the tub, she promptly went into her room and shut the door--she hates the vacuum. About 15 minutes later, was done except for her room, so I went to open her door to let her know her room would just take a few minutes, and she could get back to her game. To my surprise, she was all tucked into bed, sound asleep! And it was only 7:15. So I read Ben and Julia some "Prince Caspian," we called Matt for them to say goodnight, and I took them up to bed. Rachel and I watched some TV together, and Matt and I were talking on the phone late when Emma came downstairs to find me. Sigh. I tried to put her in her own bed a few times. Didn't work. So I put her in my bed, cursing to myself that the one benefit of being husbandless this week is having the entire bed to stretch out in. I had just fallen asleep (you know, that state where you're totally still and you now you're drifting off, but you're still aware of what's happening?) when I heard a kid go into the bathroom. Naturally, it wasn't one of the girls, who would have gone back to bed. It was Ben. No, he didn't have to go to the bathroom. He was looking for Daddy. I reminded him Daddy's away, but I'd take him up and tuck him in again. Nope. He could sleep in Emma's bed; her room is next to ours, so that's better than upstairs, right? Nope. "Mama," he said seriously, "I don't want to sleep alone." I let him into bed with us. These two kids don't take up as much room as Matt, it'd be fine. Hmmm. It would have been fine, except my restless little bean was diagonal in the bed, with her feet planted against my legs. When I pulled Ben in, I was completely locked in. Couldn't move at all. One good thing is that Ben is, no question, the best snuggler in the entire world. My girls are all over the place when they sleep, always have been. Ben just scooches into your body and stays that way. And he's warm. And his hair smells so nice. But still. I would have given that up in a heartbeat if I could have moved a bit! Add the dog at the foot of the bed, 2 kittens in the crook of my knees, and a cranky but sweet old cat sitting on my hip....let's just say I woke up this morning feeling about a hundred years old! We've been away for Thanksgiving, which is why I haven't posted. We had a wonderful day in Somerville, NJ with almost the whole family (Amy, Roger & Chloe are, of course, in Vienna--you were missed!) and some friends, too. This year we went back to the church hall, which in the past few years had fallen out of favor, but since we were 36 strong this year, it was wisely decided that there would be more room at the hall than in David and Donna's house. The main benefits of the hall are: a restaurant kitchen in which to prepare the giant feast, a gym-like atmosphere for the children to run around like mad things without breaking anything (they even played basketball while the adults enjoyed coffee and talk! )and, for Poppy, the fact of the full bar gives him a job! He loves nothing more than to play bartender to all. People gathered round the bar to talk and laugh, and Julia was doing her "vibrating eyes" trick, which she said was "entertaining the bar folk!" Anyway, this long story is leading somewhere! Emma was the only child to sleep on the way home. (I know, great, huh?) She'd been asleep for around an hour and a half, and given the long day, I didn't think anything of it. I carried her in, and did get into bed with her to snuggle when she woke up. She appeared asleep a few moments later, so I got up and headed into the bathroom. I was startled when she came in. "I'm ready for breakfast!" she announced sleepily. "Uh--sweetie, it's the middle of the night," I said, amazed. "Time to sleep." "No, Mama, I don't think so," she said firmly. "I'm not going to bed!" She plunked down on the bathroom rug, ready for battle. I won't bore you with all the details, but I went back to bed with her twice, then gave up and left her sitting on the floor. Rachel put her to sleep twice, but she just would wake up when no one was there with her. Finally, at midnight when I was ready to sleep, I simply got into bed with her, and that was it. Guess she just needed someone with her, because she didn't move for the rest of the night. Today Ben tied his shoes all by himself! He has been trying to do it for a few months, but because he rarely wears shoes that tie (mostly he wears sneaker with Velcro--today it was raining so he wore his work boots). He was so proud and happy, especially when he managed to tie the other one. To be honest, I was really happy when he tied the other one; I wondered if he could replicate it! I told him I was proud of him and would post it to the blog. 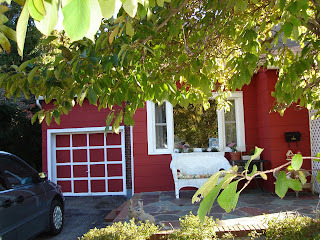 I was surprised when he asked me several hours later, "So, did you post it on the blog yet?" Last night we had friends over for dinner, and they brought the wine. Since I made lasagna, they chose some beautiful merlot, and we had a wonderful evening of food, wine, laughter and talk. We had about a half a bottle left over, so out it came with tonight's dinner--we wouldn't want it going bad while we're away for Thanksgiving, now would we? Julia asked if she could have a taste. I said sure, but I didn't know if she'd like it. She sniffed it, then took a sip, made a face, and said, "Yuck! That tastes terrible!" Then she stopped, thought a moment, and said, "But actually, it does have a rather appealing aftertaste!" Pretty good for seven years old. Julia, Ben and Emma have been downstairs in the family room for the last hour and a half, playing a really loud game. I know at one point they were pirates because I heard them shouting about getting to the ship and various "Ayes!" and "Mateys!" coming up the stairs. I went into the kitchen to get my coffee, and met them in the kitchen. Julia was in the mermaid costume, Ben had a wooden sword and a silk scarf around his waist (looked like a skirt but was probably supposed to be a belt...) and Emma had on her leopard costume. Julia was on the counter, getting glasses out of the cupboard. "You are the Queen," she informed me. "The Queen of the Mermaids!" "Then why am I getting my own coffee?" I thought. "I am?" I said out loud. "then I command you to keep playing!" "We're getting a drink," Julia said, as if I wouldn't deduce that from the glasses and the counter scaling. Seeing that this could degenerate into a knock-down, drag out fight if Emma was denied beer when the mermaid and pirate were having some (do I need to worry about the teen years?!) I said indulgently, "Oh--let her have some. She looks thirsty." Ben and Julia looked doubtfully at each other for a minute. They started debating about cubs being old enough to drink beer. Lilly waited patiently for the verdict. Finally, they conceded, "Okay, Lilly, you can have some beer--but it has to be mixed with grape juice! We don't want you drunk at the Mermaid Ball later!" I need some more coffee, please. I really should start my shopping. I hate this, every single year. Anyone who knows me I love to shop--but Christmas is too much pressure. I have a list a mile long, there's always the decision of which friends are close enough to actually buy for, who I should bake for, who should just get warm holiday wishes. The pressure of finding gifts that people actually want and need and will like. Not to mention everything else going on at the same time: baking cookies, decorating the tree and outside, trying to fit in parties and special activities and traditions, packing and visiting relatives, Rachel's birthday and party, our anniversary, etc. etc. etc. Not to mention the frenzy of the stores, everyone desperately hunting for gifts and eventually not really even caring what they buy, just that they're bringing home stuff. And as soon as I get home,I realize that I need more wrapping paper or tape or gift tags or chocolate or ribbons or whatever. Plus the yearly decision about what the kids actually need--we have so many toys that we could supply most third world countries with enough to make every child there ecstatic. Every year I vow that I will shop all year to take the pressure off. I don't. Every year I vow that I will do everything online and never go into a store at all. Sure I will! Every year I shop all in December and go crazy doing it. I guess 2008 will be the time to actually stick to a New Year's resolution! While looking at a blog, I found a little button that said, "What is your blog rated?" I took the test just for fun, and we are rated PG, for the words of "death" (when our chicken died we posted it) and "punch" (we made punch for a party and took a picture of it!) So, let's just say these quizzes got a bit addictive! I don't think the kitchen floor has ever been so clean--they were skating around for forty five minutes! I did have to advise them to dump the soapy water and switch to plain water, but after the rinse cycle the floor is sparkling. I wish I could have them do the wood floors, too--but too much water there could really harm them, so I'll stick to the kitchen. One less floor is one less floor! You may have noticed that I haven't blogged in over a week. 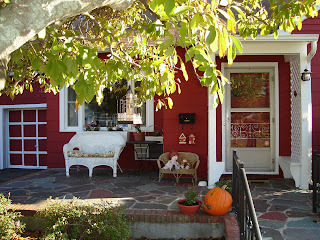 That's because Matt and I have been painting the exterior of the house. Don't even get me started--yes, I know it's November. Yes, I know we should have done it months ago. Suffice it to say that we planned to do it in May, then June, then October--and it didn't get done. So now we are scrambling and suffering with cold temperatures and rain every other day halting us in our tracks. Anyway. We began last Sunday, then worked on Wednesday and Thursday too. We were benched Monday, Tuesday and now today and tomorrow for weather concerns, but we have gotten the front of the house completely done and the west side of the house (the other side very visible from the street) nearly done. It is a really tedious job, but there's satisfaction in it--I don't think any paint has been applied in twenty years, so it's nice to see clean shiny paint where things were dull and chipping. 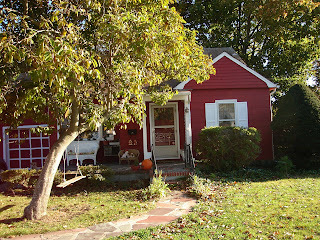 We chose Benjamin Moore's cottage red for the walls and white for the trim--sort of a reverse of what we had. It really makes a difference with the walls not being white--the house looks different, maybe more solid or substantial. Not sure what the right word for it is. That being said, even though we are looking forward to being done--we won't really be done. Because it's so late in the season, we will only have time to do one coat. The Benjamin Moore guy said that we should do one coat, which will protect the wood over the winter just fine, then do the second coat, which will be for looks and to keep the paint lasting over 10 years, in the spring. So the thought of doing this all over again in the spring is horrifying. On the one hand, it isn't all over again--it will be easier because there's no scraping or prepping, and the one coat will smooth the way to make it easier. But, there are things we are leaving off for the winter that will have to be done in the spring--inside the garage we have window trim, a screen door and an interior door, and both sides of the door leading into the shed. Window trim on the inside of the shed. All the interiors of the window frames. Wicker furniture and an outside table that need a fresh coat. And last (and least in Matt's opinion, but not in mine!) the chicken coop, because the red that it's currently painted is going to look terrible sitting next to the red of the house! 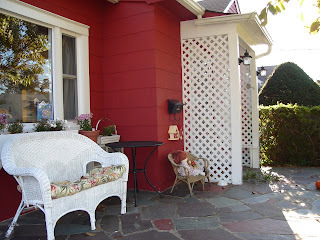 And I just have to say that although one of the things that drew me to this house was the way the front entry has the latticed arbor, the benches next to the door, and the nice roof over it all---I spent more than an entire day just painting that! The results are worth it, though. This morning Ben, Julia and Emma were playing PlayDoh. Our neighbors around the corner, who live on a busy street, don't get trick-or-treaters, so they bring treat bags to kids they know in our neighborhood! Our kids have made friends with them because they have two adorable dogs--Bear is a Pomeranian and Charlie is a King Charles spaniel. So the bags they brought were full of PlayDoh, candy and treats. It's great to have nice neighbors! Anyway, this is the conversation between Ben and Julia. Ben had made a candy shop from PlayDoh, and Julia was a worker, arriving for her first day on the job. The problem was, Ben hadn't made a door on his shop! Julia: "I could climb in under the floor." Ben: "Ummmm...no, I don't think I want you to do that." Julia: "I could break a window and come in that way." Ben: (thinks for a minute.) "Julia, I don't think my boss would like that!"